Facing unprecedented refugee flows owing to civil wars in El Salvador, Guatemala, and Nicaragua, and to repressive dictatorships in South America, key stakeholders from ten countries in Latin America convened in the seaside town of Cartagena de Indias, Colombia in November 1984 to discuss the international protection of refugees. The meeting, which grew from the recognition that the region lacked the institutional infrastructure and legal norms to deal with such crises, resulted in the Cartagena Declaration on Refugees, hailed by experts as a progressive milestone in refugee-protection law. The declaration established a protection framework that the region continues to employ today, and which several countries have enshrined in law. Intended as the first step in an ongoing regional protection project, the Cartagena Declaration continues to have relevance more than three decades later, even though its signatories have implemented its protection principles in different, sometimes uneven, ways. The 1984 agreement was groundbreaking in several ways: 1) it broadened the definition of “refugee” to include individuals fleeing “generalized violence, foreign aggression, internal conflicts, massive violation of human rights or other circumstances which have seriously disturbed public order,” while excluding mention of traditionally defined forms of “persecution” that could result in objection by the country of origin; 2) it linked and enshrined three distinct threads of international protection—humanitarian law, human rights, and refugee rights—in a regional accord; and 3) it emphasized regional solidarity and the practice of burden-sharing through “solidarity resettlement” as the basis for cooperation on humanitarian protection, foreshadowing language that would be adopted later by the European Union. The declaration also created minimum standards for treatment at every step along the pathway to protection, from entry and reception of asylum seekers and refugees to local resettlement and integration. Even as the declaration expanded the understanding of who could be considered a refugee under the 1951 Geneva Convention Relating to the Status of Refugees, it retained the requisite burden of proof placed on claimants who must prove real risk of harm before protection is offered. The framework, however, lacked a specific implementation mechanism and countries signing the declaration were free to determine whether and how to incorporate its guidelines and principles into national protection legislation. The differing levels of implementation have had a dramatic influence on the reality of protection in some signatory countries, while proving less consequential in others. In general, there is still much room for improvement in on-the-ground implementation across the region. This article examines approaches to the protection of displaced populations in Latin America in the 30 years since the signing of the Cartagena Declaration. The region has faced many humanitarian challenges, foremost the massive displacement caused by the hemisphere’s longest-running armed conflict, the Colombian civil war. The article also explores the development of further regional protection instruments amid the evolving Colombian crisis, the varying applications of Cartagena in Colombia’s neighbors Venezuela and Ecuador, and humanitarian protection pledges in response to the current global displacement crisis. Since 1984, participating countries have taken steps to further policy development and cooperation around refugee resettlement within the regional framework of Cartagena, with several important implications for the situation in Colombia. In 1994, the San Jose Declaration extended protection to internally displaced persons (IDPs), who constitute the vast majority of those displaced by the Colombian conflict. In commemoration of the 20th anniversary of Cartagena, representatives from 20 countries in the region gathered in Mexico in 2004 to set concrete steps addressing Colombian displacement, resulting in the Mexico Plan of Action to Strengthen International Protection of Refugees in Latin America. Participants focused on the need to further develop asylum systems and the protection capacity of governments and nongovernmental organizations (NGOs). The meeting spurred the passage of new protection legislation in a number of countries, including policies to address refugee status determination and integration issues, and established the regional Solidarity Resettlement Program. In December 2014, representatives from 28 countries and three territories across the Americas convened in Brasilia to mark the 30th anniversary of the Cartagena Declaration. At the end of the meeting, officials adopted the Brazil Declaration and Plan of Action, agreeing to further the work begun in Cartagena and move toward implementing durable solutions for displaced persons, including local integration and strategic use of resettlement, while living up to the high standards for protection established by the earlier measure. Large-scale displacement caused by Colombia’s long-running civil war between government forces and insurgent guerrilla groups has been the biggest humanitarian challenge facing Latin America since the launch of the Cartagena Declaration. For more than half a century, armed factions including the Revolutionary Armed Forces of Colombia (FARC) and the National Liberation Army (ELN) have devastated remote, rural parts of the country. This violence, in combination with militarized antinarcotic operations funded by the U.S. government, has killed 220,000 people, pushed millions off their land, and forced hundreds of thousands to flee the country. In the 1960s, long-simmering tensions resulting from structural inequality, political exclusion, and the forced dispossession of the land of some 2 million peasants by large landowners, combined with support for the Marxist ideology espoused by FARC and ELN, exploded into war after Colombian army units attacked several peasant communities. Rebel groups demanding land reform gained followers throughout the Colombian countryside, while acting against the state by engaging in kidnapping, extortion, and terrorism. Through the 1980s and 1990s, FARC grew in wealth by entering the illegal drug trade. The result was the rise of right-wing paramilitaries that aligned with cartel leaders who saw the rebel groups as a business threat. The United States, in conjunction with the Colombian government, sought to defeat both the insurgents and drug cartels with Plan Colombia—a series of herbicide programs designed to eradicate coca crops. Critics challenged these efforts did little to stem drug use while exacerbating the conflict and contributing to further displacement. The early 2000s saw an uptick in violence among warring factions and internal displacement of civilians. Refugee surges began in earnest in 2002, when peace talks between FARC and government forces broke down. Although the opposing parties have engaged in peace negotiations since 2012, military operations continue. Colombia is home to one of the world’s most severe displacement crises, with more than 340,000 refugees outside the country and 6.5 million people internally displaced, according to estimates from the UN High Commissioner for Refugees (UNHCR). Deprived of their land, more than 80 percent of IDPs have sought shelter and security in Colombia’s cities. Despite not having participated in the original Cartagena colloquium, Ecuador arguably has demonstrated the greatest commitment to implementing the declaration’s protection mechanisms. The small Andean country is host to the second-largest number of refugees and asylum seekers in Latin America with more than 133,000 as of June 2015, the latest figures available from UNHCR. While its refugee policy has not always been consistent with the principles of Cartagena, Ecuador’s expressed motivation to accept responsibility for protection amid regional cooperation most closely embodies the ideal of solidarity resettlement established in the declaration. Ecuador’s tradition of generosity in welcoming refugees began with its incorporation of the Cartagena Declaration refugee definition into domestic law in 1987 and inclusion of the 1951 Refugee Convention provisions in a presidential decree the same year. In 2008, Ecuador enshrined its commitment to refugees in a new Constitution instituting the “principle of universal citizenship,” which removed entry visa requirements and recognized mobility, citizenship, and the ability to safely seek asylum as fundamental human rights regardless of migration status or nationality. Critics have charged the policy has resulted in the free movement into Ecuador of human traffickers and other nefarious actors. The government has responded by reinstituting entry visas for nationals of certain countries found to be abusing the policy—most recently in 2015 for Cuba in an attempt to halt the rising flow of Cubans transiting Ecuador en route to the United States. Ecuador also implemented a comprehensive refugee policy in 2008 in the form of the Enhanced Registration Project, the first such policy in Latin America and one praised by UNHCR. The initiative streamlined the refugee registration process by shortening the waiting period for an asylum decision from months to one day. Between March 2009 and March 2010, mobile teams of government workers with UNHCR backing were dispatched to take registration directly to refugees along the northern border with Colombia who may not previously have had access to the asylum system. In that year alone, Ecuador registered and resettled some 27,740 Colombian refugees. By June 2015 more than 121,000 Colombians were living in Ecuador as registered refugees or in refugee-like situations, according to UNHCR estimates. Official statistics may be considered an undercount, as the porous, rural border between Colombia and Ecuador makes it easy for many Colombians fearful of authorities to avoid registration. In response to domestic political pressures, President Rafael Correa sought to tighten the country’s asylum system in 2012 with a decree requiring refugees to register with authorities within 15 days of arrival. This proved difficult for many refugees in remote border regions, who were often unaware of the rule change, lacked the money for transportation to a city in order to register, or feared bringing themselves to the attention of authorities right away. By requiring refugees to submit proof they were subjected to individual persecution the decree also contradicted the previously adopted Cartagena refugee definition. Amid an intense backlash from national and international refugee organizations, the Constitutional Court declared the decree violated the principle of equality embedded in the Constitution, extended the registration deadline for newly arrived refugees to three months, and restored the refugee definition to be consistent with the Cartagena Declaration. The spirit of Cartagena is not yet reflected in refugee integration policy in Ecuador. The country’s political, social, and economic institutions have not kept pace with the influx of refugees, leaving many facing obstacles in the areas of housing, health, education, and employment. Opportunities for this vulnerable population also have been limited as a result of the absence of monitoring and evaluation mechanisms at the local level, compounded by widespread discrimination and a lack of effective social programming to build networks and create employment pathways for Colombian refugees. In 2015, UNHCR and local and state partners launched a pilot project called the Graduation Model, which offers refugees financial and vocational training as well as legal assistance and microfinance resources. The program aims to put 200 refugee families in Santo Domingo de los Tsáchilas on the path toward financial stability, and could prove to be a model for future integration efforts elsewhere. In contrast to Ecuador’s humanitarian approach, Colombia’s eastern neighbor, Venezuela, has taken a series of restrictive steps toward refugees and asylum seekers. Much of its response has been shaped by the Venezuelan government’s close relations with Colombian insurgent groups and the desire by both governments to downplay the severity of the refugee situation, despite Venezuela hosting nearly 174,000 Colombian refugees and asylum seekers as of 2014. As the Colombian conflict expanded into the border regions in the mid-1990s—increasingly pushing civilians over the border—Venezuela militarized its borders and set up strict control over admissions. In 1996, while Ecuador was cooperating with UNHCR on a comprehensive refugee protection plan in accordance with international law, Venezuela’s army prepared a far narrower contingency: offering humanitarian assistance to refugees for a few days, followed by their prompt return across the border. When violence in a neighboring region in 1999 sent thousands of Colombians into Venezuela to seek asylum, the army implemented the plan in cooperation with Colombia’s civil and military authorities. Neither UNHCR nor other humanitarian organizations were granted access to the refugees, some of whom were subsequently killed upon their forcible return to Colombia, according to a report from a consortium of local NGOs. This forcible return of individuals to a situation in which their lives were in danger violated the principle of nonrefoulement enshrined in international refugee law and the Cartagena Declaration. Furthermore, the governments of Colombia and Venezuela agreed to categorically declare all persons crossing the border as “internally displaced in transit,” thereby stripping their eligibility to apply for asylum and suggesting this displacement was not international in nature. Venezuela has also accused UNHCR of “making up the presence of refugees for justifying its presence,” and has shown little interest in facilitating UNHCR’s access to remote border regions where many refugees live, denying that there is a need for the agency’s services there. In 2003, Venezuela took a step toward compliance with the principles of Cartagena and the 1951 Geneva Convention, launching a National Refugee Commission—the first government body of its kind—to review and respond to individual asylum applications and oversee the government’s efforts to provide protection to those seeking asylum. The following year, in cooperation with UNHCR, Venezuela granted refugee status to 47 Colombian nationals, the first group of asylum seekers to pass through this process. The program continues to operate, but it can take up to three years for Colombian asylum seekers to receive a final decision. As of 2014, 4,685 people had been legally recognized as refugees by the government, a fraction of the more than 200,000 estimated to need protection in Venezuela, according to UNHCR. In 2015, the Venezuelan government returned to the restrictive, heavy-handed policies of the 1990s. Following an attack on two Venezuelan soldiers by Colombian paramilitaries in the border region, Venezuela unilaterally sealed several border crossings and deported more than 1,000 Colombians. Fearing further reprisals and the destruction of their homes, an estimated 20,000 Colombians, many long-time residents of Venezuela, fled to Colombia. Venezuelan President Nicolas Maduro had been vocal in blaming food and oil shortages and other economic maladies on Colombian immigrants who, he claimed, smuggled goods out of the country. Across the region, adherence to and implementation of the principles of Cartagena have varied greatly. Brazil exemplified the spirit of the agreement as the first country in the region to create a refugee policy and consider human-rights violations as a basis for refugee status. In 1999, Chile became the first Latin American country to launch a resettlement program, inspiring inclusion of the Solidarity Resettlement Program in the 2004 Mexico Plan of Action. In support of the due-process principle enshrined in Cartagena, Costa Rica has taken steps to expand access to legal support for asylum seekers through cooperation between the country’s judicial system and bar association. In Uruguay, asylum seekers have the same rights to free legal aid services as other residents, and have the option to access legal aid clinics at universities and from the Office of the Ombudsman. Argentina has gone a step further by creating a special commission to ensure that legal aid is provided at every stage of the refugee status determination process, and that asylum seekers receive information on how to access health care, education, employment, and housing. However, other countries have yet to implement the standards established in Cartagena. In Panama, for instance, no protection is given to asylum seekers as they await a decision on their claim—a process that can take six months or more, during which time individuals are at risk for deportation (even if such removal constitutes refoulement). In Mexico, most asylum seekers are detained for the duration of the application process, and if they decide to appeal a negative decision may be subject to indefinite imprisonment. The increasing flows of Central Americans, including thousands of women and children, fleeing poverty and gang violence, have brought Mexico’s international protection obligation into the spotlight. The world is now facing an unprecedented refugee crisis, with nearly 60 million people internally and externally displaced worldwide. The Syrian crisis has struck a nerve with Latin Americans, many of whom recall their own countries’ painful experiences with oppressive regimes and civil wars. Inspired by the principles of Cartagena, a historical tradition of accepting asylum seekers from around the world, and a desire to be recognized as making a valuable contribution to the international community, some countries in Latin America have begun to open their doors to Syrian refugees. Brazil is the primary destination for Syrians seeking refuge in Latin America. In 2013 it launched a special visa program for those affected by the conflict, and as of mid-December 2015, 7,380 humanitarian visas had been issued. Individuals admitted to Brazil through the program have the right to apply for refugee status, which has been granted to more than 2,000 Syrians so far. Argentina in 2014 also launched a humanitarian visa program for Syrian refugees, and although fewer than 100 have been resettled to date, the government has reiterated its commitment to taking in more. In September 2015, Venezuelan President Nicolas Maduro pledged to resettle 20,000 Syrian refugees while reiterating his support for the al-Assad regime. The number is close to the estimates of Colombian nationals who fled Venezuela following the August crackdowns in the border region. For its part, in 2014 Uruguay resettled 42 Syrians from camps in Jordan, and has pledged to resettle 120 Syrians in total. A year later, however, the refugees wanted to leave Uruguay due to social isolation and difficulty finding employment, and protested in front of the presidential palace. Despite signing onto the Cartagena process, many Latin American countries continue to lack comprehensive frameworks and institutional capacity for refugee integration. The situation in Uruguay highlights the challenges in integrating refugees, particularly Syrians and others from different linguistic and cultural backgrounds, which has proven more difficult for Latin American countries than integrating Colombians. The Cartagena Declaration was adopted at a time when many Latin American countries were not party to the 1951 UN Convention on Refugees, or had only just become signatory and lacked the institutions to fully implement the framework. The Cartagena Declaration thus can be thought of as the start of a process rather than a benchmark itself. Some participating countries have found it more difficult to marshal the political will to take the steps necessary to achieve a more effective protection system. With its flexible set of guidelines, the Cartagena Declaration set the stage for various interpretations among party states on best practices for implementation. Greater agreement among signatories on implementation could go a long way in ensuring that the protection needs of all displaced persons in the region are met without overburdening neighboring countries, thereby fulfilling the commitments to solidarity resettlement enshrined in the declaration. Meanwhile, the war in Colombia continues to simmer, and the government’s attempts to woo back its displaced population have been largely unfruitful. The 2011 Victims and Land Restitution Law, which guarantees compensation and land restoration for millions of IDPs and refugees, thus far has not proved enticing enough to draw Colombians home. A 2013 survey of 1,300 Colombians living in Ecuador found that 84 percent said they had no desire to return at the time. It remains to be seen whether the peace process underway among warring factions in Colombia will ultimately succeed in bringing an end to the war, and the start of a long-term solution to mass displacement in the region. Brodzinsky, Sibylla. 2015. Latin American countries welcome Syrian refugees. The Guardian, September 9, 2015. Available Online. Calatrava, Almudena. 2015. Argentina official says doors open to Syrian refugees. Associated Press, September 4, 2015. Available Online. Converti, Larissa. 2015. Unfinished Business: Ecuador Continues to Manage its Refugee Population. Council on Hemispheric Affairs, July 31, 2015. Available Online. Fischel de Andrade, José H. 2014. Forced Migration in South America. In The Oxford Handbook of Refugee and Forced Migration Studies, eds. Elena Fiddian-Qasmiyeh, Gil Loescher, Katy Long, and Nando Sigona. Oxford: Oxford University Press. Garcia, David. 2014. Landmark Decision for the Protection of Refugees in Ecuador. Norwegian Refugee Council, September 26, 2014. Available Online. Gillin, Joel. 2015. Understanding the causes of Colombia’s conflict: Inequality. Colombia Reports, January 7, 2015. Available Online. Gottwald, Martin. 2004. Protecting Colombian Refugees in the Andean Region: The Fight against Invisibility. International Journal of Refugee Law 16 (4): 517-46. Gutierrez Silva, Rodolfo. 2012. The Impact of the Cartagena Declaration in Latin America – The Case of Ecuador. Human Rights blog, September 4, 2012. Available Online. Jokisch, Brad D. 2014. Ecuador: From Mass Emigration to Return Migration? Migration Information Source, November 24, 2014. Available Online. Leutert, Stephanie. 2012. Dispatches: Ecuador’s Invisible Refugee Population. Americas Quarterly (Winter 2012). Available Online. Neuman, William. 2015. Colombians Flee Venezuela’s Crackdown on Immigrants. The New York Times, August 27, 2015. Available Online. Ortiz, Gonzalo. 2010. Migration: Ecuador’s Open Doors Begin to Close for Some. Inter Press Service, September 10, 2010. Available Online. Pessina I., María M., ed. 2011. La protección internacional de refugiados en las Américas [The International Protection of Refugees in the Americas]. Quito: United Nations High Commissioner for Refugees (UNHCR). Available Online. Tiralongo, Elena. 2015. One For All and All For One: Latin America Unified in Addressing Refugee Crisis. Council on Hemispheric Affairs, October 9, 2015. Available Online. United Nations High Commissioner for Refugees (UNHCR). N.d. Population Statistics. Accessed January 12, 2016. Available Online. ---. 2004. Venezuela: Historic step for National Refugee Commission. Press release, February 10, 2004. Available Online. ---. 2009. Mobile registration project for Colombian refugees in Ecuador. Press release, March 27, 2009. Available Online. ---. 2015. Colombia. Accessed January 12, 2016. Available Online. ---. 2015. Giving refugees from Colombia a stable life in Ecuador. Press release, April 8, 2015. Available Online. ---. 2015. Latin America. Accessed January 12, 2016. Available Online. ---. 2015. Resettlement and Other Forms of Legal Admission for Syrian Refugees. Available Online. ---. 2015. Venezuela. Accessed January 12, 2016. Available Online. U.S. Department of State. 2015. Country Reports on Human Rights Practices for 2014: Venezuela. Washington, DC: State Department. Available Online. White, Ana Gugliemelli. 2012. A Pillar of Protection: Solidarity Resettlement for Refugees in Latin America. UNHCR, Policy Development and Evaluation Service, Research Paper No. 239, June 2012. Available Online. Women’s Commission for Refugee Women and Children (WRC). 2002. Unseen Millions: The Catastrophe of Internal Displacement in Colombia. New York: WRC. Available Online. Marissa Esthimer was Editor of the Migration Information Source, MPI's respected online journal. Ecuador: From Mass Emigration to Return Migration? 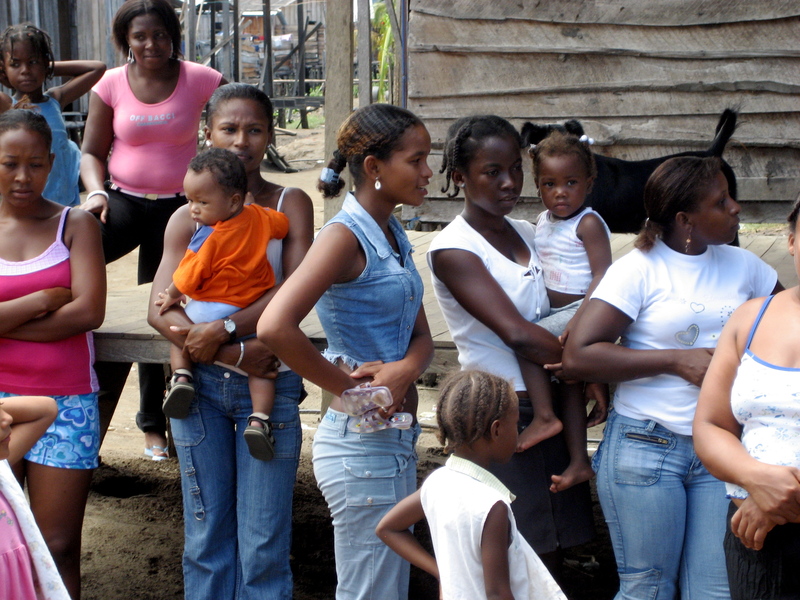 This discussion examines the situation of Colombian refugees in Panama and Ecuador; their living situations; legal status; their access to employment, health care, or education; and the treatment of groups of particular concern, like Afro-Colombian refugees, unaccompanied Colombian minors, and refugee women.